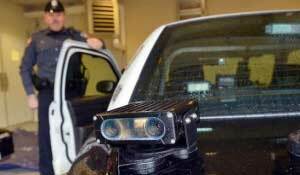 PA Township Police Call License Plate Scanners a "Game Changer"
The police department in Upper Gwynedd township are very enthusiastic about their new high-tech police surveillance device: an automated licence plate reader, or ALPR, with it’s ability to scan and identify 3,600 plates per minute. But what happens with all the data for which there are no “hits”. That data still lives somewhere. These devices have the ability to match plates to a database on a laptop inside a police vehicle. When the system records a match, the officer is immediately alerted, and can take whatever action is required. The most common usage for theses license plate scanners is to identify stolen vehicles, but they can be used to identify and flag anyone wanted by the police for any reason: suspended driver’s licenses, outstanding warrants for failure to appear in court, person of interest in an investigation, or even municipal back taxes or unpaid parking tickets. But the real questions arise with all of the license plates scanned, tagged, and logged that do not match with the database. That data has already been collected, and lives on somewhere. With a nationwide network of ALPR devices, there is a massive amount of surveillance data being collected on people who have done nothing wrong, and are not suspected of any crime or misdeed. Yet the government now has a log that they can search at any time, showing where your car was spotted, at what time, and what location (via GPS location tracking). According to the article, that information is uploaded to the FBI’s National Crime Information Center and Pennsylvania’s Commonwealth Law Enforcement Assistance Network (CLEAN). Any anyone who knows anything about data can tell you that it basically never goes away. It always lives somewhere. With enough data, and they are quickly getting to this point, if not there already, the government can look back at where you’ve been and what you’ve done for the past year. They can even draw associations with other people. What other cars are often parked near you when you are parked at that church, or bar, or community meeting? What kind of conclusions might they draw based on tenuous or random associations? It is worth serious consideration whether we should allow the government to collect all of this information with no protections whatsoever on the privacy and civil liberties of law abiding citizens.